After 25 years working in Italian kitchens, Tobie Puttock has consumed more espresso shots than many would dare attempt in a lifetime. At just 18 years of age, Tobie would watch as waiters brought a tray of 12 espressos to the kitchen for the staff of four on the hour, and they’d drink every one. Growing up, Tobie’s parents weren’t big on coffee. His first taste of Nescafe was thanks to his “bogan best mate” at 17, but it is the aroma of coffee he recalls most, brewing in his godmother’s restaurant. It’s still the thing he enjoys waking up to each day. “The first thing I do in the morning is put a pod through my Nespresso machine, which is like getting a big warm hug to start the day,” he says. Tobie might sneak in a second or third coffee, but he’s done by midday, a far cry from his commercial kitchen days. Tobie is an Italian food purist, and handmade fresh pasta is his specialty. He admits to “butchering” many animals over the years, but recently he’s gone a bit “plant curious” and introduced vegan foods to his diet. Along the way, he’s stumbled upon a coffee and mushroom powder called chaga, which claims to offer the same kick as an espresso shot but without the side-effects of insomnia and exacerbated anxiety found commonly in a caffeine overdose. For the record, it’s legal and a non-hallucinogenic. A little curious, Tobie ordered it online. Tobie has travelled extensively, and enjoyed his fair share of coffee around the world, but through it all, he says Melbourne remains the most progressive of coffee cultures, with London close behind. Just as Australia has exported its star baristas and coffee trends, we’ve also shared our culinary talents with the world, including Tobie. Fresh out of high school with no job, money or car, and only drinking and snowboarding on his mind, Tobie’s dad encouraged him to get a kitchenhand job to fund a move to the Swiss or Italian Alps and pursue his sporting passion. Tobie started washing dishes at his godmother’s restaurant, and he really enjoyed it. He then set up work at what’s now Entrecote, but the job fell through a week before he was to commence. Instead, Tobie went for an interview as a kitchen hand a Caffé e Cucina on Melbourne’s Chapel Street, dressed in his dad’s suit with a folio of school reports in hand. The next day Tobie started work at 6am, had an espresso coffee, ate spaghetti aglio with peperoncino for lunch, and made l’insalata di calamari from start to finish in one hour. He loved it. Tobie worked at Caffé e Cucina for six years until a work colleague invited him to visit his family in Ancona, Italy. Tobie’s parents bought him a one-way ticket for his 21st birthday. He slept on a couch with fond memories of his friend’s Italian mamma waking him at 5am to see if he wanted gnocchi for lunch. It was his gateway to the Northern Italian Alps (Cortina d’Ampezzo), and for the next few years, he “Europe jumped”, cooking in Italian restaurants, learning “kitchen Italian”, and snowboarding. In the ‘90s, Tobie went to work at The River Café in London and there he met fellow chef Jamie Oliver. The two were friends, but little did Tobie know Jamie’s phone call a few years later would give him the direction he needed. “I had opened a little restaurant back in Australia, but it didn’t give me the creative freedom I wanted. I was in a lull in my career. I even contemplated going to university, then out of the blue Jamie called and said, ‘dude, want to come back to London and head-up Fifteen restaurant with me?’” he recalls. Founded by Jamie, Fifteen restaurant offered disadvantaged and marginalised youth the opportunity to train to be chefs. Tobie worked in London as Fifteen’s Executive Chef, and eventually ran Fifteen in Melbourne for six years. “It took a lot of years off my life, but it gave my career a bigger purpose. I’m proud of what I did with the young kids, and hopefully we changed some lives,” Tobie says. 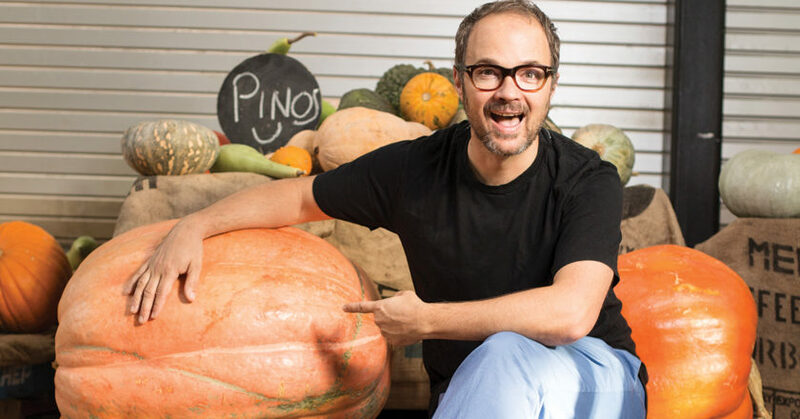 He has continued his mentorship role as Creative Director of Jamie’s Ministry of Food, responsible for scaling up the initiative with new projects into the next decade. The not-for-profit is working to transform food habits and educate children and communities about healthy eating. “London, and especially Italy and France, have much lower levels obesity than we do. Australia at the moment has an obesity rate of 63 per cent for adults and 27 per cent for kids. We’re probably looking at the first generation where kids will pass away before their parents at the rate we’re going,” he says. The full article features in the June 2018 edition of BeanSceneMagazine.